When you walk through a park, go for a hike or take a trip to the zoo, most of the animals and plants you see appear symmetric. Whether it’s an oak leaf or an elk’s antlers, the right and left sides match. It’s much less common to find examples of asymmetry -- or things that are out of balance -- in nature. But scientists aren’t exactly sure why symmetry is so prevalent. One idea is that it may be beneficial to have a spare body part in case one side is injured. Or perhaps it’s just easier to move through the environment with matched pairs of legs, fins or wings. Symmetry also tends to look balanced and harmonious to our eye. And we’re not alone in that feeling. Many animals seem to show a preference for symmetry in a potential mate. It can be a clue that the mate has the genes necessary to develop properly and thrive in an environment full of stresses and dangers. But some critters buck the trend. Like the earwig, a diminutive insect found on every continent except Antarctica. Andrew Zink, an associate professor of biology at San Francisco State University, has been looking at how symmetry affects earwigs' success when it comes to social interactions. He’s studying maritime earwigs, a larger and more powerful cousin to the common European earwig you might find in your backyard. Both creatures bear fearsome-looking pincers on their backsides. And they aren’t afraid to use them to defend themselves. Zink knows all about that. “It feels like someone is pinching you with tweezers,” said Zink, standing by the shore of San Francisco Bay on a recent earwig expedition. 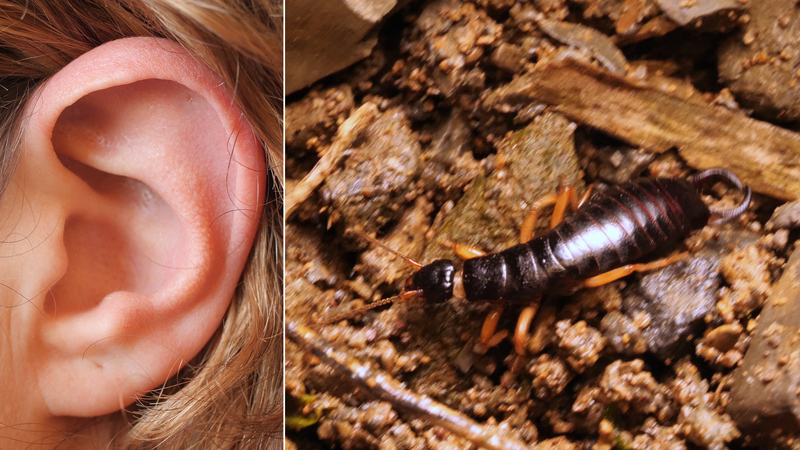 He also regularly debunks a common myth: Earwigs are not interested in laying their eggs in your ear, he said. The first thing to know about all earwig pincers is that females have straight pincers while males have curved. Scientists call the pincers cerci. It’s thought that cerci evolved from a previously existing additional rear pair of legs among the ancestors of insects. Maritime earwigs make their living along the shoreline, scavenging among rocks and eelgrass for dead sea life and hunting tiny prey, like sand hoppers. “If you go down to the shoreline and sit on a rock for a while, you’ll see them,” Zink said, as he turned over one impressively sized rock after another. The best place to find maritime earwigs is under rocks, driftwood and decaying plants around the high tide line, where they take refuge from the sun and encroaching waves. It can get crowded under those rocks and life isn’t always peaceful down there. If two male earwigs run into each other, they will typically engage in a ritualized battle for dominance. The fighting gets especially fierce around the spring mating season. First, the males check each other out with their antennae, possibly to gauge the size of their opponent. Then they stop and turn around so that their pincers face each other. Once they’re in position, they attack. Using their pincers, they strike and grab at one another. The curved shape of the males’ pincers allows them to grab on to the sides of their opponent’s abdomen and squeeze. Sometimes the wrestling match can be fatal. Winning these battles may allow the winners to gain more access to preferred territory, which can mean more food and better access to females. “In general the larger earwigs win more often,” Zink said. But there’s more to it than size. 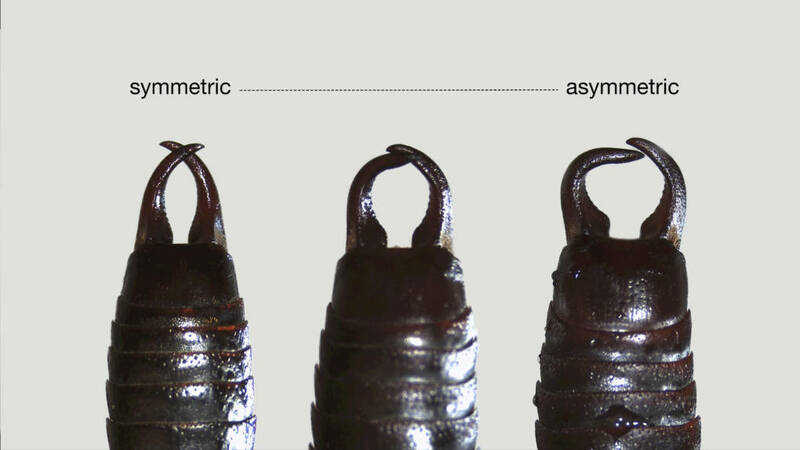 While many males have nearly symmetric pincers, others have one side shaped differently than the other. Typically it’s the right-side pincer that curves in more sharply on the asymmetric males. That difference in shape struck Zink and graduate student Nicole Muñoz as fascinating, because asymmetry like this is usually less attractive to potential mates. It can be a big drawback, evolutionarily speaking. The researchers wondered if there might be some other advantage to that asymmetry that outweighed the potential hit to their attractiveness. So Munoz brought maritime earwigs into the lab and ran staged fights to see if the symmetry of the males’ pincers had any effect on the outcomes. She found that when evenly sized male earwigs battled, the one with the more asymmetric pincers tended to win more often. By slipping the straighter side under their opponent’s abdomen, the asymmetric males are able to bring the point of the more curved side down tip first. This grip worked better in fights and the researchers saw cases where males would pierce their opponent’s shell with that curved tip. That means death for the loser. “It’s like bringing a knife to a wrestling match,” said Zink. But how would this asymmetry affect a male’s ability to attract a mate? Vikram Iyengar, an associate professor of biology at Villanova University, studies just that. Rather than focus on who wins the most fights, Iyengar looks at which features female earwigs look for when selecting a mate. That’s important because female earwigs seem to be the ones that make the decisions when it comes to mating. Females are typically larger and stronger than males. And their straight pincers function more like scissors, making them especially dangerous. Iyengar found that female earwigs are unusual, too. Under laboratory conditions, the female earwigs he studies didn’t seem to care if a male’s pincers were symmetric or asymmetric. Together, the two studies might explain the prevalence of asymmetry in those male earwigs’ pincers, since it would tend to help them win fights and not hurt when it comes to mating. In addition, Iyengar found that females didn’t tend to select larger and more aggressive males, even though they might tend to win in fights more often. Instead, he found that the females preferred to mate with somewhat smaller males. On the other hand, winning fights is still valuable because it allows males to spend time in the preferred territories where females tend to be. It’s a complicated drama to be happening under a rock.